Now, that's one hefty Harley! This Batman Harley Quinn 18-Inch Action Figure features the ever-popular character and long-time Joker collaborator dressed in the classic outfit that she was introduced wearing in the Batman: The Animated Series TV show. 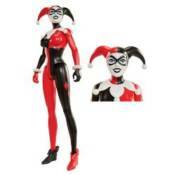 Featuring seven points of articulation, Harley measures a whopping 18-inches tall! She's the perfect jumbo figure to bring back the good ol' days when you were just a wee little lad or lass and action figures seemed so much bigger!